Working in a hospital as a chaplain intern has brought the thoughts of healing to the forefront of my mind in a way unlike anything ever has before. Prior to taking on this role, my relationship to physical healing was shaky. I barely spoke of it because I really don’t have an idea of how it might work. I thought that focusing on healing was more of a distraction to the gospel than a confirmation of it because I knew that, for some people, receiving the type of healing they ask for in the way that they think it should come usually is a sign of whether or not God is listening. When looking at the Cross, I found it difficult to believe that God only affirms us in times of comfort. Knowing that even Jesus prayed to get out of suffering and yet still had to endure it, I felt like supporting the notion that God’s approval looked a certain way was irresponsible. And yet I also felt that telling people that they may just have to bear their cross can sometimes lack compassion. So I avoided the subject altogether. But at the hospital, that is something you just can’t do. So recently I have been praying for God to help me understand healing more and what it means to be made well. Recently our Pastor, Paul Sangree, my wife, Kelly FitzSilva, and ordained minister, Ed Babinsky led a class on healing for 8 weeks at the church. They used the book, What About Divine Healing? as their text in exploring many of the questions that Christians have about healing. I was only able to sit in on a couple of classes but was able to go over the coursework with Kelly. The chapter that spoke to me the most was chapter 2, Do You Want to Be Made Well?. It referred to John 5:1-9 where Jesus asked that very question of a man who had been sitting by the Pool of Bethesda for years waiting for someone to put him in the pool so that he could be healed. 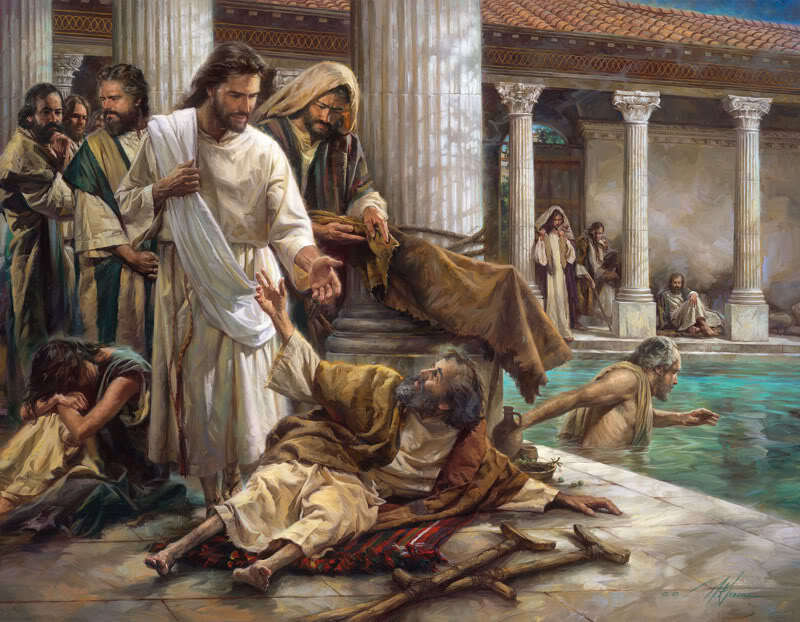 When Jesus asked the question of the man, rather than simply answering “yes” the man proceeded to explain how no one ever took him to the pool so that he could be healed. The book goes into how the man’s response is a typical human response. Instead of just asking for what we want or saying what we want when asked, we often just explain why things are the way they are and lament. Why is that? Is it because we are afraid that if we say what we desire directly and don’t get it, then we will be disappointed? Is it because subconsciously we know that if we get what we ask for we will have to change? After all, a healing of every kind is a change. And people characteristically do not like change even when it is in their best interest. I meet patients all of the time who are told that changing their diet and some unhealthy habits will considerably improve their situation and yet they don’t tend to want to make those changes while simultaneously wanting to get better. How can we interpret that? Does it mean that we don’t really want to get well or does it mean that getting well and changing our habits are seen as mutually exclusive to some people? But then we might ask how many times did Jesus follow a healing with a statement equivalent to “go and sin no more” (see John 8:11)? It was questions like these that contributed to my attempts to avoid the issue of healing. The fact is that I don’t have the answers. But what I do believe is that if we do ask to be made well or if we answer “yes” when the question is asked of us, God always responds in an affirming way. I’d even go so far as to say that God’s very being is the affirmation of our well being. What is difficult is surrendering to that way and being because change is embedded in the request–a change of our physical situation, a change in our relationships, a change of job, diet, etc. etc. etc. When we ask to be made well, we are asking for the removal of whatever stands in the way of God’s revelation of our whole selves. But does this mean that God will cease to affirm us when we refuse to change? I don’t think so. I think God keeps God’s promises even when we don’t keep up our end. God is God’s promise to us. In God all things are well to include the things we often interpret as tragic–such as an innocent person being crucified. In God is the perfect and whole pattern of who we are and what the world will be. I have come to consider that when we ask for a healing or to be made well, it is the same as asking to see ourselves as God sees us–as God’s eternal children. That is to say that to see ourselves as the children of God is the peak of health and wellness no matter what our physical condition or life circumstances may seem to be. That is the power of Jesus’ life, death, and resurrection. All manner of things are well. 28 And we know that all things work together for good to those who love God, to those who are the called according to His purpose. 29 For whom He foreknew, He also predestined to be conformed to the image of His Son, that He might be the firstborn among many brethren.30 Moreover whom He predestined, these He also called; whom He called, these He also justified; and whom He justified, these He also glorified. I have read that it is time for us to give up that idea of needing to be healer at all, as that implies something is wrong, when in truth, we are WHOLE right now. That is similar to what you are saying here as Jesus saw the perfection in people which assisted their bodies in revealing that perfection. Whoever wrote that is probably right. Ultimately that is my stance. However, like quantum physics demonstrates, our perception affects physical “reality”. So I would imagine that those of us who strive to see wholeness will “invite wholeness” into the lives of others and we will all experience it as healing even though it may really simply be an awakening to what already is. To be healed is to become whole (or, as you say, to be able to see ourselves that way), so to be whole is also to become holy. So perhaps that is part of the resistance to being healed -the ego protecting itself with the illusion of separateness. Because to become whole, and holy, is to let go of all claims to “I”, “me” and “mine”. HBF your words are true. So often we are fighting over identity and we don’t even know it. Ultimately Christ teaches that we must give up the false identity of separation for the true identity as being One with God. People have straight up told me that their fear is that if they give themselves totally to God then they will lose who they are. Sort of like what happens sometimes when we get in romantic relationships or have children. But the reality is that we always become more of who we are, because our reality is in relationship. Thanks for being here.